Immune Response - Your body's first line of defense. The immune system is our body’s incredibly complex defense network comprised of trillions of immune cells representing 1/5 of our total body cells, with the purpose to defend us against substances that do not belong in our bodies and can potentially cause infection and disease. The immune response is the mechanism the body uses within the immune system when activated to recognize, respond and resolve infection and disease attacks. As humans, from the time of conception, we are confronted with attacks by infectious agents including viruses, bacteria, and fungus plus parasites and environmental toxins. For us to survive, our immune cell responses must recognize and determine the location and characteristics of pathogens immediately; then appropriately respond to kill the health invaders by chemicals or disrupting and breaking down the cell membrane (lysing) of a pathogen. Then phagocytosis occurs performed by phagocyte cells. Innate and adaptive immunity are the two divisions of the immune system with some immune cells participating in both. Innate immunity involves defense mechanisms that are nonspecific and attack any antigen considered non-self without an origin from within the body. Included in innate immunity are the skin, tears and mucous membranes in the nose. Antigens are non-self health invaders that come into the body and trigger an immune response due to chemicals unique to a specific antigen. Antigens are primarily microbes including bacteria, fungi and parasites. Antigens originating from our environment include viruses, chemicals, toxins, pollen and more. Harmless antigens that cause allergies are called allergens. Phagocytosis means “big eater” while the phagocytosis process involves a cell engulfing a particle, digesting the particle, and then expelling the waste products. Phagocyte cells protect the body by phagocytosing or ingesting pathogenic or harmful non-self foreign particles, bacteria, fungi and dead or dying cells. Phagocytes include neutrophils, monocytes, macrophages, dendritic cells and mast cells. These phagocytes all have surface receptors by which they can detect pathogens, especially bacteria, viruses, fungi and even parasites. The steps in the process of phagocytosis include: 1. particle ingestion by a phagocyte after antigen recognition triggers the formation of a phagosome. 2. phagosomes fuse with lysosomes to creates a phagolysosome particle. 3. digestive enzymes from the lysosomes break down the phagolysosome particle, with the waste exiting the cell by exocytosis. As an example of an immune response, activated macrophages ingest a body invader such as a virus and display pieces of the virus known as antigens on the macrophage surface. The helper T-Cells recognize specific antigens on the macrophage surface (apc cells) and bind to the macrophages. 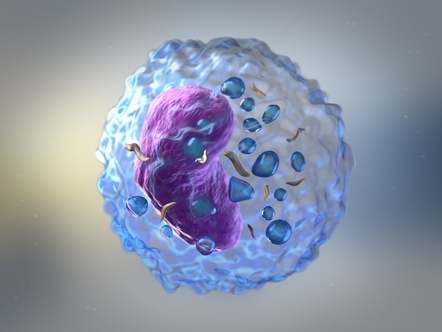 The helper T-cells then evaluate the situation and call in the various immune system components needed to fight back effectively against a specific antigen. The helper T-cells also activate the humoral side of the immune response, including the B-cells. B-lymphocytes develop and mature in the bone marrow and on presentation of a foreign antigen (non-self) on invasion of the body, begin to divide and secrete a protein known as an antibody. These unique antibodies then bind to the antigens on the surface of the health invaders, enabling recognition by the macrophages and various T-cells classified as Cytotoxic T-cells that kill with chemicals and NK or Natural Killer T-cells that kill by lysing or ramming the pathogens. 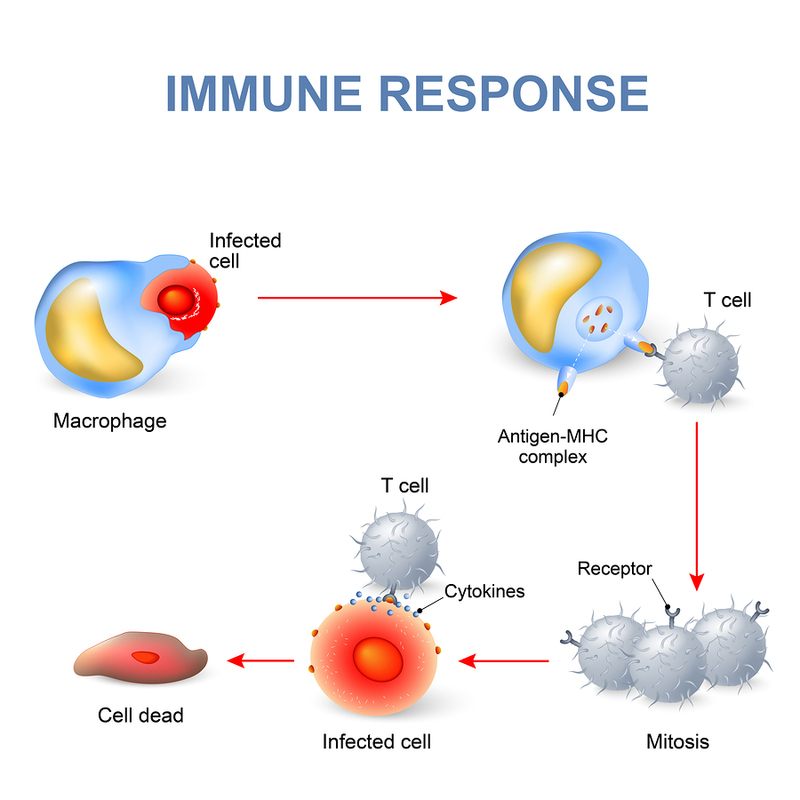 T-lymphocytes or T-cells are part of the cellular immune response. These lymphocytes are also produced in the bone marrow where they then migrate to the thymus to become mature T-cells. On the surface of the T-cell is an antigen-binding molecule known as the T-cell receptor. The T-cell can bind antigen, but it must be in the presence of a complex of proteins on the cells of the host, called the major histocompatibility complex (MHC). T-lymphocytes are mainly involved in the response to altered cells of the host, as in those infected by a virus or those that develop into cancer cells. This antigen binding also alerts blood components known as complements (actually 25 different proteins) to puncture holes in invader infected cells. This facilitates phagocytosis, or ingestion of the invader by phagocytes such as the macrophage. As the health invader is killed and brought under control, the activated T-cells and B-cells are signaled to stop attacking by suppressor T-cells. Another type of T-cell, the Memory T-cells, remain behind to create acquired immunity and to respond quickly against the same type of invader, if the same health invader attempts to attack again. Your body contains millions of antibodies at any given time. We often translate this to mean we are building up an immunity to various viruses, bacteria, fungi or parasites. Vaccines present a very small quantity of a specific antigen for which the B-cells produce antibodies unique to the specific antigen that are then available as memory cells to respond quickly if a future attack occurs as in influenza or polio. Lymphocytes are white blood cells or leucocytes in the human immune system consisting of B and T cells which form antibodies for immunity and natural killer cells which fight viruses and tumors. Macrophage literally means, “big eater” and these constantly vigilant policeman in your system are just that – immune soldiers for your defense! These immune cells recognize, engulf and destroy any cells, organisms or substances that are “non-self” or do not belong in the body. Macrophages are the immune cells that start and play a major roll in directing the immune process. They not only fight individually, but they send chemical faxes to the other defense fighters in the immune system. The key is to enhance their arsenal of defense by arming them with better weapons and making their ability to recognize the “bad guys” more readily than normal or when suppressed. In various parts of the body, the macrophage may be referred to as: Lungs – Alveolar cells; Kidneys – Mesangial cells; Brain – Microglial cells; Liver – Kupffer cells; and Skin – dendritic Langerhans cells. The macrophages, as each of us, become less able to fight back and their vision becomes suspect as we grow older or are compromised by disease. How Does Microparticulate (MG) Beta Glucan Enhance and Normalize the Immune Response? Microparticulate (MG) Beta glucan works through activation of unique receptors on the surface of the Macrophage and Dendritic immune cells that are approximate matches in size for the Beta glucan when processed to be microparticulate particles 2-3 microns in size. This means Beta 1,3/1,6 glucan extracted from yeast cell wall and micronized, nutritionally normalizes these huge white immune blood cells, which are the first line of defense in your body. The unique extraction process of the Nutritional Scientific Corporation (NSC) isolates the MG Beta 1-3/1-6 glucan to eliminate harmful proteins that can cause negative yeast reactions. Beta glucan is again unique in nutritionally promoting the Interleukin 1 (IL1) production that is beneficial to insulin production in the pancreas. The Beta glucan nutritionally modulates and potentiates as appropriate to normalize the macrophage to maintain a state of readiness. Proper diet, adequate rest, moderate exercise, reduced stress and appropriate supplementation with vitamins, minerals, enzymes and nutritional supplements such as microparticulate beta glucan available in NSC-24 Original 30 ct, Extra Strength NSC-100 60 ct and NSC Immune Plus 60 ct are essential to nutritionally contribute to a program to regain, maintain and normalize the immune response. Watch a brief YouTube commentary on the Immune Response by Frank Jordan. Listen to informative 3 minute audio commentaries by Frank Jordan nationally broadcast on the Frank Jordan’ Commentaries now heard M-F on Sirius/XM Satellite Radio at 4:26 pm Eastern on Channel 131. Information and statements regarding dietary supplements or other products have not been evaluated by the Food and Drug Administration and are not intended to diagnose, cure, treat, mitigate, or prevent any disease. Immuneresponse.org© 2017-2018. All rights reserved.